LOS ANGELES, CA (March 25, 2014) As we approach the month of April, much noise will me made about autism awareness as World Autism Awareness Day (April 2nd) kicks off a month of activity. Much of the dialogue will be generated by neurotypical people clamoring to stop an illness, end an epidemic or find a cure, vernacular which is combative. But within the community of people living on the autism spectrum or working with those who demonstrate signs of autism, there's a quieter chorus focused on the idea of acceptance and finding respectful ways to work with neurodiverse individuals. In Too Sane for This World , director William Davenport allows twelve adults with different types of autism to let their voices be heard. The film, shot and edited with a mostly autistic crew, will become available on DVD on April 8 from Cinema Libre Studio with On Demand platforms in May. The film features twelve people, some with Aspergers Syndrome and others considered "high-functioning" autistic, such as Temple Grandin (author and professor), Robyn Steward (a musician and trainer/mentor for others on the spectrum), Greg Yates (who studied biophysics and psychology at U.C. Berkeley and MIT respectively) and Rudy Simone, who has written four best-selling books on Aspergers. The film, which was an official selection at the Hawaii International Film Festival and was an honorable mention that the SAMHSA Voice Awards in 2012, also features other adults who are perhaps less high-functioning but are still working hard to find a meaningful place in our society. In the film, Steward suggests, "No matter what somebody's disability is, they have a great number of things to offer to the world. And it's just a matter of being able to see those things and work around them. Because even the most able-bodied person has difficulties if you think about it." Davenport (CITIZEN AUTISTIC) has worked in commercial film production for years and developed educational courses on digital filmmaking for U.C. Berkeley, San Francisco State and the Art Institute of San Francisco before. He also has earned a Masters in Special Education with a certificate in autism studies. He became the Executive Director of the Autism Social Connection in Northern California, where he created a unique filmmaking program to teach skills to children, teens and adults on the spectrum. He recently relocated to Washington, DC and currently and currently teaches filmmaking to teens on the spectrum at Ivymount School. Says Davenport, "This film is about breaking the myths of how we view people on the autism spectrum. It is about giving a voice, where a voice has been silenced by society. The general public needs essential information about autism, and the true nature of living on the spectrum." 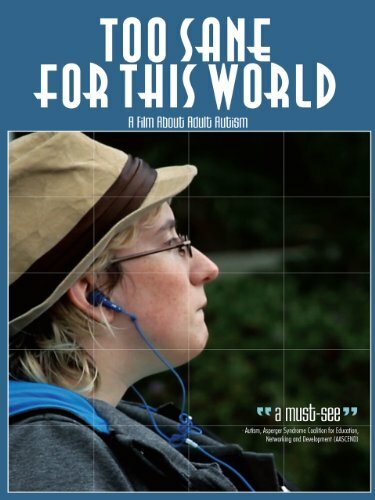 "Filmmaker William Davenport's revealing documentary, Too Sane for This World, tells the heartfelt story of adults living on the autism spectrum. Davenport's insightful interviews and arresting camerawork take us into the lives of these extraordinary and yet often misunderstood individuals. The film is a must-see for teachers, professionals and parents who work with Asperger's and AS," says Camilla Bixler, Co-Director AASCEND (Autism, Asperger Syndrome Coalition for Education, Networking and Development). A percentage of Davenport's profits will be donated to AASCEND. Too Sane for This World explores the challenges, gifts, and distinct perspectives of 12 adults on the autism spectrum. Featuring an introduction by bestselling author, Dr. Temple Grandin, and interviews designed by adults with high-functioning autism, the film discusses many of the problems facing the autism community - from bullying to marginalization and discrimination. A unique collaboration between neurotypical and atypical individuals, men and women living on the spectrum speak candidly about defining and coming to terms with their autism, difficulties they've faced, and the experiences that have shaped their lives, illustrating the neurodiversity of the mind and its limitless potential. The 63 minute documentary will become available in North America on April 8 on DVD (at traditional DVD retails outlets) and streaming platforms to follow on month later (May 8, 2014). Bonus features include: "Space Cadet" Music Video, Featuring Array, featuring Robyn Steward and Mark Tinley (formerly of Duran Duran) and directed by Davenport. Trailer and Interactive menus. ABOUT CINEMA LIBRE: Cinema Libre Studio is a leader in distributing social-issue documentaries and features by passionate filmmakers. Headquartered in Los Angeles, the Cinema Libre team has released over one hundred films including the Sundance Audience Award-Winning FUEL, THE END OF POVERTY?, Rachid Bouchareb's LONDON RIVER and Oliver Stone's SOUTH OF THE BORDER. The studio is in pre-production on John Perkins' best-selling memoirs, CONFESSIONS OF AN ECONOMIC HIT MAN, into a major motion picture. For more information and updates, please visit: www.cinemalibrestudio.com| Updates | Facebook | Twitter .